Just learned of this a few weeks ago. I guess I missed the announcement last year. Coincidentaly, I find EVO has a back page blurb on the history this month. The exterior of the 911 was originally designed to emulate the great drag-coefficient of the 356 (just 0.29 for the 1950 Coupe). 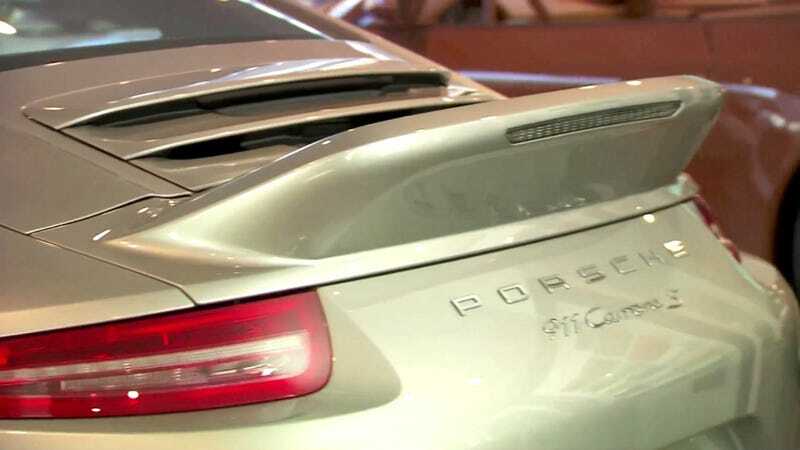 As the 911 became faster, poor straight-line running at highway speeds, pronounced sensitivity to side-winds, and sudden lift-off oversteer at high speeds were becoming serious problems. The FIA rule changes for '72 forced Porsche to shift focus from their 917s to the street based 911. They started with the 911S. It had a Cd of 0.381 and lifting forces of 83kg front, and 115.5kg rear at 143mph. Tests on the new design found the most effective solution to be making the rear of the car flatter, and terminating it with an almost vertical panel. This was deemed too drastic and the design was diluted to the ducktail first seen on the '72 2.7RS. It was a winning solution on three fronts. It bettered the balance of the car front to rear, lowered the lift, and actually lowered the Cd of the car. Used with the special front air dam with a wide flat central area to house an oil cooler, the RS had a Cd of 0.397, and at 152mph generated just 35kg of lift front, and 42kg rear. Without the ducktail, Cd rose to 0.409, front lift fell slightly to 32kg, but rear lift rose to 245kg! The ducktail was also shaped to smooth the airflow over the tail lights to combat dirt deposits.